While there are literally thousands of knots, in reality a person can probably get by with about ten good knots committed to memory. Even in this day of straps with buckles and bungee cord, knot tying is still a key outdoor skill that at a minimum can make your life easier and at times could even save a life in a survival situation requiring first aid or rescue work. 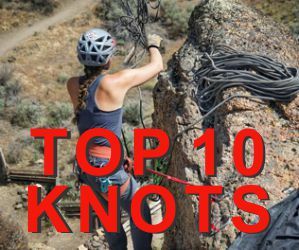 The knots in this top ten knots section make for a good selection that should cover most situations. A simple knot to tie a rope to a post. Tie up bundles of items. Join ropes of unequal size.